TAUNTON, Mass. – Not only did Needham make 11 threes in Saturday night’s Div. 1 South final at Taunton High but the Rockets also timed them perfectly. Five of them in the first quarter, including one from just inside half-court by Thomas Shaughnessy at the buzzer, a big three to end a Mansfield run in the second, and three in the fourth quarter that each time matched a Mansfield basket. The long range shooting of Thomas Shaughnessy (game-high 26 points, including four threes) and Matthew Shaker (20 points, including six triples) and strong play defensively to limit the Hornets on the offensive end propelled Needham to its first ever sectional title with a 65-56 victory. Needham brought four busloads of fans to the game and the energy of the crowd translated to the play on the court, as each of the five threes in the first quarter was followed by a salute of some sort to the crowd. Shaker buried three from beyond the arc in the first and Shaughnessy had 10 points, including a pair of threes. Mansfield, which is normally a team that makes a fair amount from long-range as well, knocked down only one three, from junior John McCoy (11 points) but were having some success taking the ball to the basket. Senior Max Boen had four of his 10 points in the first but also added three of his six assists and three of his four steals. In the second quarter, the Hornets started to put things together on the offensive end and limited Shaughnessy to just a single point. An 10-0 run to start the second, capped by a Tyler Boulter (10 points) three put Mansfield in front, but Brandon Monheimer hit a pull-up jumper and then Connor Reidy hit a three-pointer (his only bucket of the game) to give Needham a slight edge. Phil Vigeant stole the ball at mid-court and scored plus a foul to give the Hornets a 33-32 lead at the half. In the third quarter, it felt as though Mansfield may just start to pull away against the Rockets, who were making the program’s first ever trip to the South final, but again clutch shooting put the Rockets back in front. Boen skipped a pass across to Christian Weber for a three from the corner and then scored on a pair of drives, including one acrobatic finish in the lane with his back to the basket. Each time, Needham had a response and Shaughnessy gave the Rockets the lead for good with a three that made it 47-44 and assisted on a basket by Mike Klemm at the buzzer for a five-point lead heading to the fourth. In the fourth, Mansfield could not find a way to make a run. Every time the Hornets scored, Needham responded with a basket of its own to only increase the excitement of the crowd, which the Rockets clearly fed off. Boulter buried a three to start the quarter but Shaker answered right back with his fifth of the night. Vigeant knocked one down at the other end to bring Mansfield back within two only for Shaker to hit one from five or six feet behind the line. Boulter scored off an assist by Sam Goldberg but Shaughnessy got free for a corner three that was the dagger for the Rockets. Needham shot 7-for-8 from the line in the final minutes to seal the win and bring the fans storming out onto the court to celebrate. Mansfield finished at 23-3, including 15-1 in the Hockomock League. BROCKTON, Mass. – Mansfield has been known for its ball movement, decisive three point shooting and machine-like offense. But they’re a pretty good defensive team as well — and the top-seeded Hornets proved that on Monday night. In a game with points coming at a premium, Mansfield’s defense shined and its offense made just enough plays down the stretch to pick up a 43-39 win over #4 Bridgewater-Raynham in the D1 South Semifinals. The Trojans came into the contest averaging 67.5 points per game. It marked just the second time that B-R was held under 50 points — the only other time was when Mansfield beat the Trojans (52-45) back in January. “Talk about a fantastic game on both ends, by both teams on the defensive end,” said Mansfield head coach Mike Vaughan. “I don’t know if we can say our offense or their offense was bad, I think the defense on both ends was that good. We had to have a great game plan [defensively] and I think our guys executed it. B-R had a great game plan and they executed it too. I think it came down to a few late baskets, a couple of free throws down the stretch, a couple of big rebounds we were able to secure that put is in a position to win the game. Though there weren’t many big runs, one of the most important stretches of the game came at the midway point of the final quarter. Bridgewater-Raynham used a 5-0 spurt to tie the game 35-35 on a three point play from EJ Dambreville (18 points, 13 rebounds) and a basket from John Tesson (eight points, eight rebounds) with 3:33 to play. On the ensuing possession, with the shot clock in single digits, Mansfield had its response on the other end. Max Boen (eight points) drained a three to put the Hornets back up, 38-35, with just over three minutes to play. It was just Mansfield’s second three-pointer of the game. 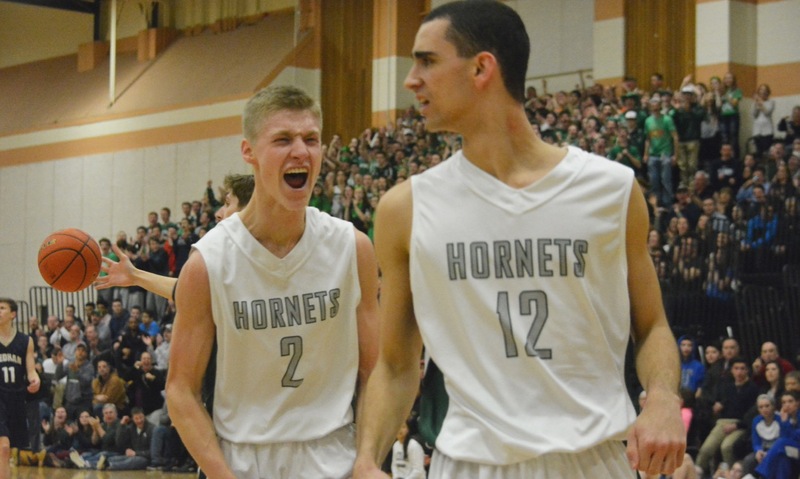 After making their first attempt of the game, the Hornets missed 15 straight until Boen’s shot. The Hornets came up with a big stop on the other end as Dambreville was called for an offensive foul. On the offensive end, Mansfield used up the majority of the shot clock before Christian Weber found Sam Goldberg (11 points, 11 rebounds) down low. Goldberg was fouled and added a three throw to put Mansfield up 39-35 with just over two minutes to play. 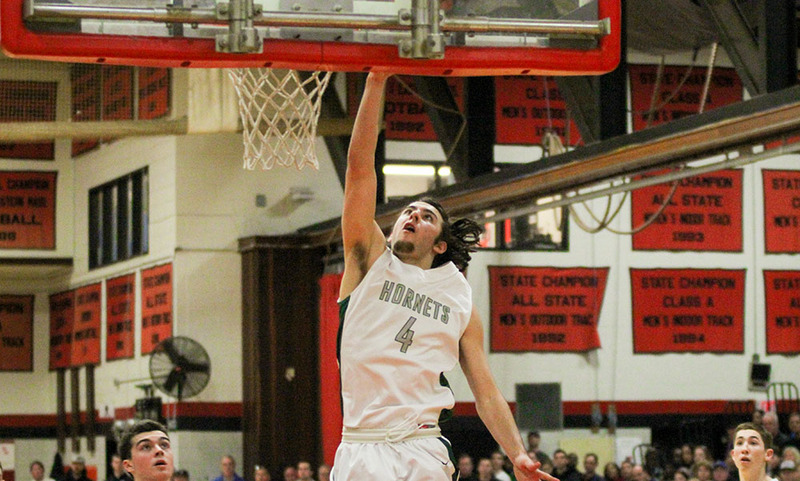 On the defensive end, Sam Hyland came up with a big block for the Hornets. The Trojans got possession back but Bobby Long was whistled for an illegal screen to give Mansfield the ball back. Mansfield took all 30 seconds of the shot clock, unable to get a shot off before the buzzer. But once again, Mansfield was disciplined on defense and stepped in to take a charge from Hesson. “[B-R] is good and they’re talented and they can put five guys on the floor at any time that can score,” Vaughan said. “We preached for a couple of days at practice this week that we had to be disciplined, we had to keep the ball in front of us. This wasn’t the same B-R team we played a month and a half ago. I thought the guys answered the test. Guys had to take on some matchups – we had some mismatches in the post, we had help, guys got beat off the dribble, help defenders slid in to take the charge. Overall, what a great defensive effort from both teams and I’m proud of our guys that we were able to maintain that for 32 minutes. Mansfield missed on the other end at the end of the shot clock but B-R couldn’t convert either. Goldberg hauled in the rebound – his fifth of the second half – and was fouled. He made both to put the Hornets up 41-35 with 20 seconds to play. B-R scored on the other end but Phil Vigeant (nine points, three rebounds), iced the game with two free throws with 11.7 seconds to play. Mansfield’s started the game with a terrific first possession, filled with plenty of ball movement and then a three from Vigeant. But that would be their last made three point until the final minutes of the game. The Hornets were just 1/9 from three point in the opening quarter. However, Mansfield got an offensive boost from an unlikely source. Evan Christo, who had been one of the top defenders for the Hornets, came alive with four points and four rebounds in the opening quarter. Christo put Mansfield up 5-0 with a put back and then 9-4 with another late in the period. He scored the opening basket of the second quarter and added a huge block in a one-on-one situation in the fourth quarter while Mansfield held on to a four point lead. After taking a 16-15 lead into halftime, the Hornets fell behind twice in the third quarter, and even were tied with a minute to play in the third. However, John McCoy found Goldberg cutting to the basket and the senior drained two free throws to give the Hornets a four point lead (30-26) going into the fourth. “We just had to stick to what we did well all year,” Goldberg said. “Shots weren’t falling but we had to just keep shooting and attacking the basket, get down hill. B-R did a great job of getting up on us so we utilized back door cuts and slips in the second half. Goldberg scored nine of his 11 points and five of his 11 rebounds in the second half. Mansfield boys basketball (23-2) advances to the D1 South Final to take on #3 Needham (19-4). It marks the fourth time since 2011 that the Hornets have reached the sectional final while this is Needham’s first ever appearance. The teams will square off on Friday at Taunton High. The time has yet to be announced by the MIAA. #1 Mansfield, 71 vs. #8 Quincy, 43 – Final – Mansfield drained 12 three pointers and had a significant rebounding advantage to knock off the Presidents. Sam Goldberg had a team-high 12 points and hauled in eight rebounds. Tyler Boulter (11 points), Christian Weber (nine points), John McCoy (eight points), Phil Vigeant (eight points) Ryan Otto (six points) and Max Boen (five points, five rebounds) each had at least one trifecta for the Hornets. Mansfield advances to the Div. 1 South semifinal to face No. 4 Bridgewater-Ranyham. #10 Foxboro, 40 @ #2 Westwood, 52 – Final – Foxboro cut the deficit to just three points with less than four minutes to play but couldn’t complete the comeback against the Tri-Valley League co-champion Wolverines. Joe Morrison (eight points) drained a three with just over three minutes to play to cut it to 42-39. However, Westwood finished the game with a 10-1 run to advance. Morrison held TVL MVP Tim Giovino scoreless in the first half. Giovino finished with 13 points – six on free throws and also hit a transition three. Senior Jamaine Few had a team-high 12 points while classmate Mark Clagg chipped in with seven points. #11 Oliver Ames, 66 @ #3 Whitman-Hanson, 79 – Final – Click here for a recap of this game. #4 Franklin, 3 vs. #13 Brockton, 1 – Final – Franklin advances to the Div. 1 South quarterfinal and will face Framingham on Sunday, 3/5 at 4:45 p.m. at Gallo Arena in Bourne. #8 Mansfield, 1 vs. #9 Xaverian, 2 – Final – Mansfield sophomore Coleman O’Brien tied the game in the second period but Xaverian retook the lead, scoring the game-winner within a minute. Tony Rullo had 33 saves for the Hornets. Attleboro, 86 @ Durfee, 80 – Final – Attleboro erased a 10-point deficit to begin the final quarter, rattling a 16-2 run over the final three minutes of the game to earn a season sweep of the Hilltoppers. Trailing 78-70, Bombardier senior Jake Dunkley (28 points) drained a three and then junior Nate Douglas poured in nine straight points of his own. With Attleboro up 84-80 with 17 seconds to go, Lucas Boucicaut hit a pair of free throws to ice the game. Douglas finished with 20 points while freshman Qualeem Charles added 14 points and Elvin Sam chipped in with 10 points. Mansfield, 80 vs. Weymouth, 35 – Final – Mansfield set the tone early, jumping out to a 21-4 lead at the end of the first quarter. Phil Vigeant led the way with 13 points and five rebounds while Sam Goldberg added 11 points and six rebounds, Christian Weber had 10 points and six assists and Evan Christo added 10 points and three boards. North Attleboro, 68 vs. Bishop Feehan, 51 – Final – North Attleboro senior Brent Doherty tied a career-high with 28 points as the Rocketeers picked up their seventh straight win. Big Red scored 24 points in the first quarter, building a double-digit lead then and never looking back. Doherty added a half court buzzer beater at the halftime buzzer to give North a 39-27 lead at the break. Senior Jonny Friberg added 16 points and 12 rebounds while classmate Kyle McCarthy chipped in with 11 points. Mansfield, 54 vs. Abington, 59 – Final – Mansfield junior Meg Hill scored a team-high 21 points, added 10 rebounds and had four blocks and was named to the Roundball Classic all-tournament team. Ann Maher added 14 points for the Hornets and was also named to the all-tournament team. Oliver Ames, 51 @ Norwell, 34 – Final – Norwell cut a double-digit deficit down to six heading into the final quarter but the Tigers held the Clippers to just four points in the final frame. Kayla Raymond led OA with 19 points and 10 Rebounds while Abby Reardon finished with 13 points and five assists. Stoughton, 3 vs. Norton, 1 – Final – Luke Bainton, Sean Doherty and Brendan Campbell each found the back of the net to help the Black Knights end the season with a win. MANSFIELD, Mass. – Unlike some of the other teams that Mansfield will face on its state tournament run, the Hornets are not reliant on one or two scorers to power the offense. Instead, Mansfield utilizes its depth and can turn to a number of different players to score in its motion offense. On Monday night in the nightcap of day one of the Roundball Classic against Brockton in the Albertini Gym, the Hornets showcased that depth with three players in double digits and 10 players on the scoresheet. Mansfield beat the Boxers 66-42 and advanced to the final of the tournament to face Weymouth. 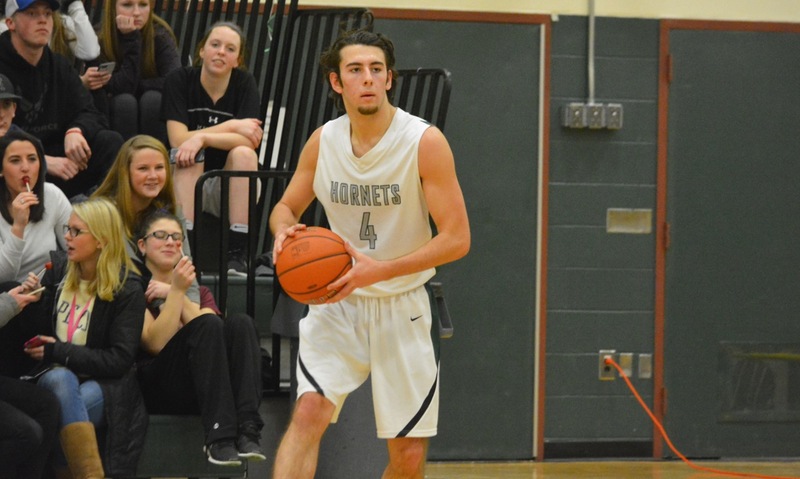 Even though a balanced attack is Mansfield’s strength, the Hornets also know that when they need baskets they can turn to senior Sam Goldberg. The forward put in another strong performance with a game-high 15 points to go along with six rebounds and five assists. The Hornets controlled the game in the first quarter, but could not take advantage of the dominance because they could not make shots. Mansfield missed several layups and open looks from deep but still held a 12-6 lead behind four points each from Goldberg and classmate Phil Vigeant. Mansfield broke the game wide open in the second. The Hornets closed out the half with a 13-2 run that opened up a 17-point lead by the break. Senior Benjamin Albanese got the run started with an offensive rebound in traffic, kicked it out to Max Boen who fired a pass to Vigeant for the layup. Albanese added the next five points and then assisted on a three by Boen. Christian Weber finished the run with a drive to the basket for his lone hoop of the first half. Brockton made a run to try and keep it close in the third quarter behind nine points from Quran Harris, but Mansfield continued to make the shots it needed, including Vigeant (12 points) drilling a three off a Weber pass to extend the lead back to 13. Weber added a three-pointer and then Sam Hyland tossed an alley-oop to Goldberg. With just six seconds on the clock and the ball under the Brockton hoop, Mansfield turned to Weber to close out the quarter. The senior raced up court, weaved through traffic and hit a floater at the buzzer for a 46-30 lead. Weber (six assists) added five more of his 12 points in the fourth and Vigeant drilled another deep three. Ryan Otto and Goldberg each added four as the Hornets cruised to the victory and a spot in the final. Mansfield (19-2, 15-1) will face Weymouth, coached by former Franklin head coach Dean O’Connor, in the final on Wednesday at 7:15.